Much "more than just a girl" as the lyrics to Emily Bear's catchy Nancy Drew and the Hidden Staircase title track promises, the eponymous sixteen-year-old budding sleuth played by Sophia Lillis is, as her Aunt Helen (Andrea Anders) describes, as persuasive as her Atticus Finch-like lawyer father (Sam Trammell) and as righteous as her late mother. An upbeat, girl power fueled adaptation of the second book in the ubiquitous series by Carolyn Keene aka Mildred Augustine Wirt Benson (which was previously turned into a feature film back in 1939), penned by Vampire Diaries and Handmaid's Tale writers Nina Fiore and John Herrera, 2019’s Drew was helmed by Poison Ivy director Katt Shea, who was part of the famous Sundance class of ‘92. Having only spent summers in her dad's hometown of River Heights before they move there from Chicago following her mother's death, it takes time for the fiercely independent minded Drew to adapt to small town life where she quickly becomes known to the police department after taking on a school bully who'd been targeting one of her best friends. 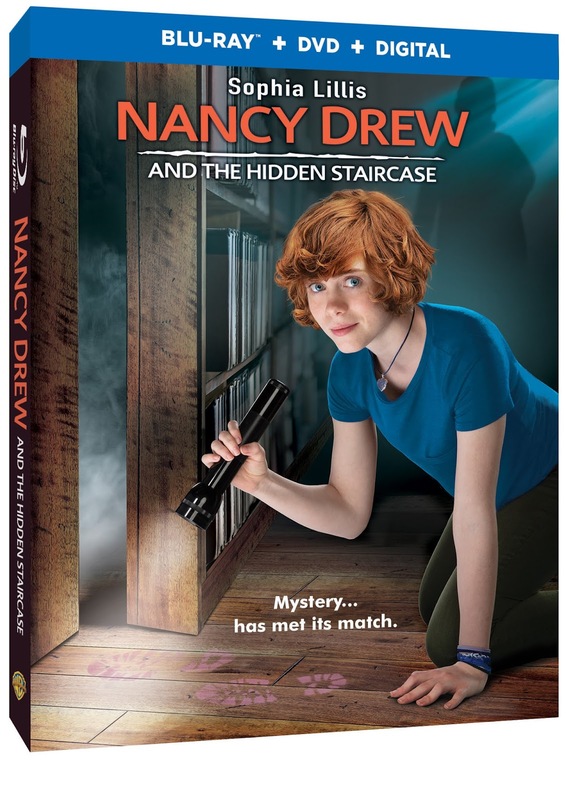 Realizing that all she's done is stoop to the bully's level, Nancy decides to use her knack for deductive reasoning and the aforementioned traits that her aunt called her "superpowers" for good when she plunges headfirst into a mystery at a spooky old mansion after meeting an elderly resident from one of the town's oldest and most well respected families who swears she's being haunted. Leaving a few plot strands open, including Nancy's friendship with a young River Heights deputy (Andrew Matthew Welch) who treats her like an equal as well as a reference to the Lilac Inn, which is the fourth mystery in Keane's collection, at times the 89 minute Drew feels like a superbly crafted pilot for a new cable TV or straight-to-disc series of movies. However, thanks to its breakneck pacing and amazing cast — led by the irrepressibly charming Lillis whose excitement is contagious and great supporting turns by Zoe Renee and Mackenzie Graham as Nancy Drew's best friends George and Bess, as well as Linda Lavin and Laura Wiggins as the two clients at the heart of the mystery — Staircase wins us over enough that you'll definitely be rooting for more installments. While the surprisingly scary special effects in one early sequence might be a bit too intense for children under the age of ten (especially without parents giving it a look beforehand), kids of other ages should be delighted by this timely, vital, and downright entertaining celebration of independent thinking, justice, friendship, and above all, girls standing up for themselves and each other while doing what is right. Executive produced by Ellen DeGeneres, the film has been given a high quality transfer to Blu-ray, complete with a few fun Drew fan worthy and kid-friendly extras including a celebration of the heroine's legacy from the cast and crew and a gag reel. 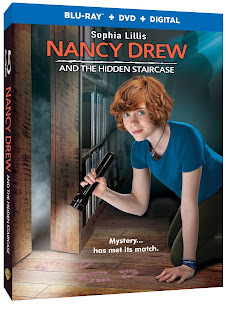 Also serving up a DVD and digital copy as part of its combo pack release, Staircase is sure to inspire a new generation of readers to discover the joys of sleuthing with Drew.